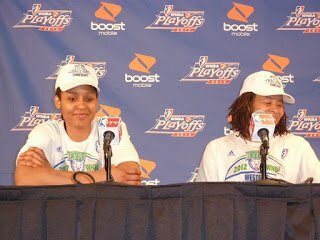 Maya Moore and Seimone Augustus answer questions from the media after the game. Candace Parker had 33 points, 15 rebounds, five assists and four blocked shots – including two underneath the basket on two consecutive Lynx shot attempts. But it wasn’t enough to keep the Lynx from winning the Western Conference title, 80-79. More later, but I had to get these quotes off of my recorder and into this space. Check out the post-game photo gallery. Well clearly we’re very disappointed. It’s very hard to move past the moment as our season ended. Anytime a season ends without a championship, it’s too early. It’s been an incredible ride with a great bunch of women who came together as a team. We were doing so many good things throughout the course of the game…..not every team can make you pay, but every mistake we made, they made us pay……They made us pay when we made mistakes, and that’s what champions do. We should have been on the other side of the floor. We were going to drive it down by one, and we were looking for a drive and have Candace be there ready for the put-back, or Beard had the option to get it to Parker on the pick and roll, and it either wasn’t a good play or it wasn’t executed very well. How to get great offensive players to buy in on the defensive end. It’s a process. They didn’t get drafted because people were saying, “boy, she sure could guard somebody.” They all made it to this point because they have tremendous offensive skills. We’ve got to amp up our defense. Over the course of the season we had the right mindset – we wanted to play defense – and that’s a start. We just need to get better at it. We were ready for the challenge tonight. We had the mindset that it’s a 120 minute series, and you have to just keep playing. It’s not decided in the first or second ten minutes. You’ve got to keep playing. We had great leadership, and we were able to stay the course. Maya Moore hit some great threes to get us back into it and give us more bounce to our step. Happy to get the W, survive and advance, and WNBA finals here we come. I thought we were over-analyzing and we…..had that paralysis by analysis. We couldn’t score the ball and then they got into transition, and that’s when they’re at their best. Our offense triggered the run they made. When you have good people, good things will happen. We do things the right way, the unselfish play. If you look at all of them, they all have the same reputation. I’m fortunate to be in Minnesota in this window of opportunity we have, it’s a good group. If I can stay out of the way and let them hoop and be themselves, then we have a chance to be successful. I’ve got great leadership in four captains. The Olympic break was an interesting challenge for our team because there was an element of pacing ourselves….the single biggest difference from before and after the break was our ability to handle adversity in the game improved exponentially following the break. I attribute that to being singularly focused. It’s really fun to play on this team because we’ve been in those types of situations before when we were down……..We’ve got to keep playing. To us, 10 points down is nothing. We’ve been through worse. We kept playing, we kept fighting. We don’t let ourselves get too high, we don’t let ourselves get too low. We stay consistent. We had each other. We had a lot of confidence and momentum coming back from the Olympics. And the intensity they had…the competitive juice was ready to flow. They were excited to have us back, and we just kept going. We have great leadership on this team that pushed us forward. The best is yet to come for her, and it looks like it’s going to be soon. She’s been playing amazing and their team has come a long way…..but I’ve been there before. She’s just got to stay focused and keep doing what she’s doing. Every year she’s come back better. I think the organization here will continue to do a great job of surrounding her with great players. They beat us by one point. You look back at different things you could have done throughout the game. Our rebounding was better from the last game. We ran and had different schemes that we did. But at the end of the day it came down to a rebound we didn’t get, closing out, on a long shooter. Obviously disappointed, to say the least, at the outcome because I really felt like we were going to win this game. I really wanted this championship, from the day we all got together…..we had a championship on our mind and in our hearts. And it hurt after we lost, because I think this is a championship team. But the ball didn’t fall our way. 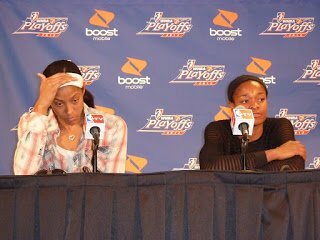 Candace Parker and Alana Beard answer questions from the media post-game. Parker did everything that could have been asked of her. It's tough to see LA bounced out of the playoffs but I think the best team won. It was the Spark's game to lose and they lost it. Parker's 45 foot three point bank shot that put them into the lead was almost pure luck. Ross then calls a time out to plan their defensive strategy to hold the lead and then LA doesn't have a defender within 15 feet of the shooter of the game winning three pointer. It was either an epic coaching / strategy failure or a total disregard by the team to follow Ross's defensive plan. No excuse either way. Then they follow up by letting MN force their defensive will upon them for their last shot. When you get out coached and out defended in the last two minutes it's almost always a bad thing. LA needs a rock solid point guard and better team defensive next year and they might have a chance. My prior post seems kinda negative. LA had a good year. Congrats to Ogwumike and Ross for their awards. Good for them. I guess I was just hoping one Spark besides Parker would go off vs MN. If Nneka just scores her season average against MN we win. Don't mean to be bagging on her as she is just a rookie but I was hoping she'd over deliver in the crunch. It might have been better from a focus perspective if she hadn't received her award right before the game. In any case, a good foundation to build from for next year. I think all Sparks fans were wishing more of their team would step up. But like you said, great foundation for next year.